Robert started complaining that his lower front teeth were really hurting him on Friday night (of course). He would cry in pain when I was brushing his teeth, so I knew that something was wrong. I mean, he doesn't always want his teeth brushed, but this wasn't a defiant cry - this was definitely something wrong. I hadn't even gone through the process of getting them registered in the OHP system for their dental care yet, so I took care of that Monday morning as soon as my work was finished. They got Robert in for his dentist appointment right away. We were first told 4:15 this afternoon, but the office called yesterday and said that if we wanted to do a full cleaning and everything, we could come in this morning. So I jumped on that chance. We've been watching the Muppet Babies where Fozzie goes to the dentist and talking about the tickly toothbrush and the tiny mirror and stuff for a few days. I even tried "sleep talk" last night when I went to tuck him in before I went to bed - whispering in his ear about how much fun the dentist will be and how they're going to take super good care of him and Jack Jack (because, of course, she was coming, too). This morning he woke up excited about it - so much so that Mikaela wanted to go to the dentist, too. They took X-rays of his teeth - and I took a picture of him in his blue and white striped, smiley face lead vest - but must have hit erase instead of save. The male hygienist (who was AWESOME) got him excited about the space ship seat that went up and down (just a regular dentist chair) and the water gun and air gun and the sucker-outer. He showed Robert "Mr. Whistle" and the special bubble gum toothpaste - and Robert even let them clean his lower teeth (though not his uppers). They said they were going to skip fluoride today because it's so sticky and he has to sit around for awhile and they didn't want to overstay their welcome with him - they wanted him to enjoy the dentist. And boy did he ever - it's all he's been talking about... that and his yellow tooth brush and business card (why is that exciting, I don't know), and the yellow sunglasses that he got to wear while they shined the bright light on his teeth. Now Kaya REALLY wants to go. They said his teeth were in excellent condition - that we were doing a perfect job of keeping them clean and healthy and to keep doing what we're doing. The only suggestion they had was that we move him to the fluoride toothpaste (we use the swallowable toddler toothpaste because R is not good about spitting out the toothpaste - he swallows the regular stuff and that makes me nervous). The hygienist suggest that we just barely put a smear of it on his toothbrush and still encourage him to spit it out - but that the little bit he would ingest won't cause stomach upset and would still be helpful for the formation of his adult teeth. Which gets us to the pain part of today's program. That's his adult teeth pushing up! The dentist and hygienist were both kind of shocked - it's a bit early for that to be happening. His teeth aren't loose, but the new teeth are pushing up and the roots of the baby teeth are starting to be reabsorbed. 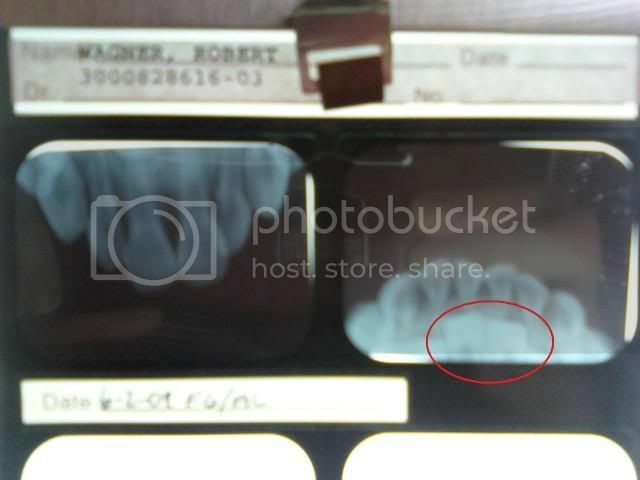 The dentist said that those are the first teeth to fall out, and they will be out within a year max - that it's early, but shouldn't be problematic for him. So, unfortunately there's not a whole lot we can do for the pain - just take it easy and if he's having a really bad day give him soft food instead of overly chewy stuff (and a pain killer if necessary). But at least it's not something awful, and he had a great time and is ready to go back. The hygienist told me to just keep up doing exactly what we've been doing with him and they don't even need to see him until next June. So yay!